The main news story today is Philip Hammond’s budget. Details of it were released a few days, and it’s been discussed ever since. In it, Hammond, dubbed by some ‘Phil the Bleak’, is trying to convince the voting public that austerity is coming to an end, and more money is going to be pumped into welfare services like mental health and the NHS, and town centre shopping in the high street will be revitalized as business rates for the shops in those areas will be dropped. It’s strange how all these promises were suddenly made just when the Tory party is seriously challenged by Jeremy Corbyn’s Labour, and is being widely attacked for its colossal ineptitude and massive divisions over Brexit, and the immense hardship it is causing with Universal Credit. I don’t doubt that the Tory press will hail – or in the case of the Daily Mail, heil, the budget as a genuine boost to the economy, which should be enthusiastically embraced by all right-thinking Brits. Just like I can remember the Sun’s headline screaming the benefits of Norman Lamont’s budget back in the late ’80s or first years of the ’90s: ‘The Lager of Lamont’. Which pretty much shows the level the Scum is aimed at – drunken yobs. And for ordinary people, you have to be drunk to think there’s any substance or real benefit in the budget. Mike’s extensively critiqued it on his blog over the past few days. Yesterday he put up a piece showing that it was all a tissue of lies. Despite his claim that austerity is over, public sector pay is not going to rise, nor are benefits, the bedroom tax ain’t going to be repealed and there aren’t going to be 20,000 more police on our streets. Furthermore, the tax cuts he’s promising will only really benefit the rich. As Mike points out, this is another swindle to decrease the amount the state takes in tax, which is then redistributed as benefits to the poor, or spent on public services. Brexit would not affect spending plans because he had assumed an “average-type free trade deal” between the UK and EU after Brexit, and had £4.2 billion in reserve in the case of a no-deal scenario. But you can bet that this will not be enough to deal with the consequences of a Tory Brexit. They want harmful effects because they will then be able to justify harsh cuts to your rights and living standards. About the only welcome announcement in the whole sorry mess was the decision to stop using hugely-wasteful Private Finance Initiative (PFI) schemes. One of Mike’s many excellent commenters, Barry Davies, points out that the PF1 and PF2 deals would simply become PPP, so there’s really no change there. Actually, I think all Hammond’s promises are worthless for the same reason Mike does: their provisional. They only have force until Brexit occurs in March, when I full expect Hammond to announce that the terrible deal forced upon Britain by the European Union will mean that they’ll have to reverse their policies and start cutting benefits, public services and again reverse their spending on the NHS. It’s all lies, from a government of liars, who lie and lie again without qualm of conscience. The Prime Minister says austerity is over. This, Mr. Deputy Speaker, is a broken promise budget. What we’ve heard today are half measures and quick fixes while austerity grinds on and far from people’s hard work and sacrifices having paid off as the Chancellor claims, this government has frittered it away in ideological tax cuts to the richest in our society. This budget won’t undo the damage done by 8 years of austerity and doesn’t begin to measure up to the scale of the job that needs to be done to rebuild Britain. The government claims austerity has worked, so now they can end it, but that is absolutely the opposite of the truth, austerity needs to end because it has failed. Corbyn’s right: austerity has failed. It’s failed working people, the poor, the disabled, the long-term sick, and the unemployed. But it’s done wonders for the rich, who’ve benefited massively from the Tories’ tax cuts, and privatization of public services, including the NHS. And, of course, the provision of cheap labour through the welfare to work industry, pay freezes and the removal of workers’ rights. Reforms all intended to make workers easy to hire and discard, and create a cowed workforce in constant fear of the sack and starvation, which will accept any work, no matter how precarious or poorly paid. And as you can see from the video, when Corbyn laid into the budget, he was greeted with the usual Tory sneers and laughter, especially from Hammond and the Maybot, who jerked and spasmed as if she was suffering a short-circuit. Well, the Tories always find working class poverty a great laugh. You just have to remember how Cameron and IDS had a right good guffaw in parliament when one woman’s suffering due to the benefit cuts was read out. Well, let’s cut their cackling short, and vote them out at the earliest opportunity. I found this on the channel of someone describing themselves as ‘Loveofpeace’. On Thursday, just before Philip Hammond released his vile, abysmal budget, the People’s Assembly organised a mass demonstration in front of 10 Downing Street, in which they piled up a small mountain of food, which they would later deliver to a real food bank. They did this to call attention to the mass starvation the Tories’ austerity policies are causing. This is just a series of short snapshots of the demo, but it shows the workers piling on the food. There’s also a performance poet attacking the media for colluding with the government. It shows the signs up demanding an end to austerity, the sacking of the Tories, and defending the NHS. There’s also a banner from one of the Marxist parties or groups, and another sign saying ‘Migrants welcome here’. There are now something like a quarter of a million people forced to use food banks. 7 million in ‘food insecure’ households, where they don’t know if this meal will be their last. And that liar Philip Hammond had the utter gall to appear on the Andrew Marr Show last Sunday and claim there were no jobless in Britain. He was wrong: Marr quoted the figure of 1.25 million. I don’t believe that, as the figures are fiddled so that they’re meaningless. I think the real figure is probably 4 million. Quite apart from the fact that most of the poor in Britain are actually in work. But they’re not making money because of low wages, zero hours contracts and all the other fiddles employers are using to not have to pay real wages. And Mike put up another piece about some female Tory from Yorkshire, somebody Pow, who claimed that people had thousands in the bank and the Tories had made them richer. Well, they have made some people richer. Those, who were rich already. The top 25 per cent. Either this woman really doesn’t know any poor people – which is possible – or she’s suffering from serious cognitive dissonance, and actually believes what her party says – or she’s a liar. Either way, she’s telling porky pies, and is totally unsuited to government. Get her, Hammond, May and the rest of the Tories out. Now. Before more people die from starvation. Another interesting report from RT, which you probably didn’t see on the Beeb or the terrestrial channels. Just before Hammond released his decidedly lacklustre, and frankly abysmal budget on Thursday, a group of workers from the GMB dressed as ‘Maybots’ – robotic versions of Theresa May to mock here robotic personality, in protest at the 1 per cent pay cap the Tories have imposed on public sector workers. They made the point that it had condemned 5 million of them to misery over the last five years. The report ends with the news anchor reporting that he had lifted some aspects of it, but not others. 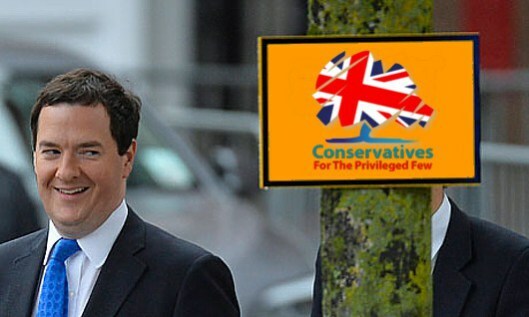 Osbo’s campaign to rob the poor to give to the rich continues. Mike over at Vox Political has this story about a report in the Sunday People that George Osborne intends to take £320 million from the National Lottery in order to balance his budget. This is money that’s supposed to be spent on charities, including foodbanks. Just when you thought the Tories really couldn’t go any lower, somehow they manage to do so. Of course, the Tories are suspicious of and despise food banks, because they give an independent sign of how people are being forced into poverty by their policies. Hence all the attempts to shrug off their massive growth with the lie that people aren’t really starving, they’re just going to them out of choice to get cheap food. Even when this is refuted by the facts, one of which is that you need to be referred by the Jobcentre before you can go there. I’m going to have to get out my dictionaries of historical and criminal slang, as I’m pretty sure there was a slang term long ago for the kind of knave, who robbed beggars. At the moment all I can think of is ‘bindlestiff’. This is American hobo slang for a tramp, who preys on other tramps. It’s just about as low as you can get. It’s not quite right, as Osbo is the scion of the Baronet of Ballymoney, so definitely not a vagrant, however much his victims may hope that he may be bankrupted and forced out onto the streets as so many others have been due to his wretched policies. But this will have to do for the moment. 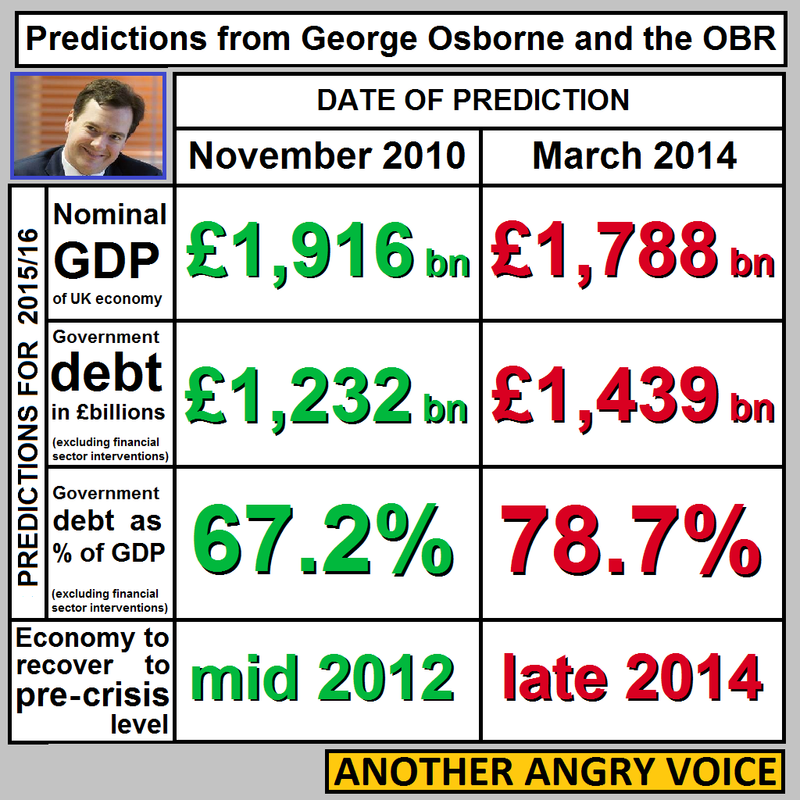 The table of Osborne’s failed predications from Another Angry Voice, illustration just how inaccurate they are. The Angry Yorkshireman has provided an excellent antidote for the approving hype surrounding Osborne’s ‘business friendly’ ‘worker’s budget’ on Wednesday. Simply entitled ‘Budget 2014: The AAV Analysis’, This succinctly describes it as ‘some pre-election bribes and some myopic tinkering with a fundamentally unstable economic system’. The Angry Yorkshireman begins by comparing Osborne’s figures now, with those he confidently gave at the start the present government. These show just how far from the reality his predications then were, and how the situation now is far, far worse than the optimistic view Osborne then had. This also effectively shows, even if this rest of the Angry One’s article didn’t, just how much worse off everyone now is under the Tories. Except the very rich, of course. He then examines the immensely harmful effects Osborne’s budget has had on workers, pensioners and savers, before noting the way Osborne increased VAT from 17.5 to 20 per cent. He has a short paragraph stating that Osborne’s budget shows that even more privatisation is on the way, and criticises the way the education system is being sold off to ‘unaccountable pseudo-charities’, who pay their managers massive salaries while paying the actual teaching staff very little. He then critiques the government’s policy towards the banks, which consists in maintaining them, and their massive privileges for senior staff at the expense of the working population, who have to suffer wage restraint and cuts to welfare services. He then attacks the government’s housing policy. This is the ‘right to buy’ scheme, which will further reduce government stocks of council housing as the government is making sure no more is being built. He then discusses the increases in government funding on flood defences and potholes. this is tacit recognition by the government that their earlier cuts to these services were wrong. However, he believes that for the government now to return some of the money they cut from flood defences after the floods have occurred is an insult to everyone, who had to leave their homes because of them. The only possible conclusion from the headline figures is that Osbornomics has failed in its own terms. The fact that by 2015, Osborne will have borrowed £207 billion more than he claimed he would, yet the economy will be £128 billion smaller too is absolutely damning stuff, but you won’t hear anything about this from the mainstream media. Many of the measures in the 2014 budget can be seen as the pre-election bribes they are intended as, yet these modest pre-election gains the Tories are providing dwindle into insignificance in comparison to the huge losses the majority of people have suffered since 2010. Perhaps the most damning thing of all is that in the very same week that the Bank of England admitted that the private banks run a money creation cartel, and a NASA backed study warned that continuation of the neoliberal economic orthodoxy threatens irreversible systemic collapse, the Tory party have once again offered no fundamental reform to the way the economic system works, in favour of shoring up the status quo, and protecting establishment interests. 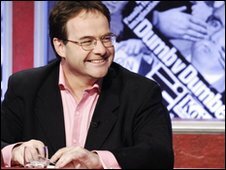 Quentin Letts on what looks suspiciously like Have I Got News For You. Mike in his piece over at Vox Political on Osborne’s budget reported on the Chancellor’s double standards regarding public sector pay. This was to be kept low, while at the same time the government’s Special Advisors were to be given a 40 per cent pay rise. The Daily Fail’s parliamentary sketch writer, Quentin Letts, has a few things to say about them in his book, 50 People Who Buggered Up Britain (London: Constable & Robinson 2009). And none of them are complimentary. Wilson was disinclined to do much heavy policy thinking himself. He darkly suspected the civil service of being a Tory conspiracy. He therefore hired others to do his thinkin’ for him. Worse, he had their wages drawn from public funds. Harold Wilson was in some ways a good Prime Minister. He kept us out of the Vietnam War, not least. He was in at least one respect, however, a very bad premier: he created state-paid Special Advisors. (p. 271). The Special Advisor is an appointed stooge, an outsider brought into Whitehall by a minister or political party. He or she normally lasts only as long in that department as the minister. Special Advisors are, by their very nature, short-termists. They tend to take decisions which help a minister avoid blame or trouble, usually at the expense of another minister, sometimes merely because the extent of a problem has been temporarily concealed. Special Advisors are antipathetic to openness. Secrecy gives them power. (p. 272). It was under John Major, who gave Cabinet Ministers rather more departmental freedom to form governmental policy with a greater degree of success, that the ‘Spads’ came into their own. And one of them is the honourable gentleman (and I use the term loosely) now running the country. David Cameron: a former government Special Advisor, of the type who were given a 40 per cent pay rise today. AS they aren’t actually Civil Servants, this is another example of the government paying massive subsidies to the government contracted private sector. He then attacks the way the number of Special Advisors massively expanded under Tony Blair, so that by 2002 there were 81 of them. His ire is not so much about the money spent paying them, but on their corruption of the governmental system. The many millions spent on their salaries may be irksome – a symbol of the waste and the stroking of the political cadre – but it was wee buns compared to the billions blown on other inessential parts of the public sector, often on the say of, yes, Special Advisors. And even more damaging was the way these Special Advisors corrupted our political system. Since the later years of the nineteenth century the British Civil Service had been a professional body. That is to say, it offered recruits a career of serious service. Entrance to the profession was possible only after rigorous examination and interview procedures. Civil servants were schooled to regard the nation as their employer. They worked for the long-term good of the country, the community, not for the good of whichever politician happened to be in power at any one time. G.M. Trevelyan, historian, wrote that the merit-baed entrance procedures to the civil service removed it ‘from the field of political jobbery’. Favouritism, nepotism and nudge-nudge-wink-winkism were trumped by measurable ability. These values slowly percolated to other parts of society. It wasn’t a bad way to run a country, you know. (p. 274). He is particularly incensed at the way the were used by Tony Blair as part of his carefully stage-managed events, and that two of them, Jonathan Powell and Alistair Campbell, were given executive rights over permanent secretaries. Letts has a particularly rosy view of the impartiality and efficiency of the British civil service. Sadly, experience has not always backed this up. Civil Servants are indeed required, under their terms of service, to provide ministers with impartial advice. I’ve no doubt that in many cases this is true. But not nearly in as many cases as we’d like. One of the reasons the railways are in the horrendous state they are in today, is because one particular senior civil servant, who was named in Private Eye, was a passionate enthusiast of free-market capitalism, with the result that they were privatised. The result is poor service, increasingly bloated subsidies for the rail companies, and the administrative chaos that led to several serious disasters like Potter’s Bar. These were particularly reprehensible because of the way the victims were denied justice and compensation for years afterwards as each company passed the buck from one to the other. As a Daily Mail journo, Letts is, of course, a man of the Right, and has cause his fair share of offense writing for an offensive newspaper. He appeared a little while ago defending their attack on Ralph Milliband, Ed Milliband’s father, a Jewish refugee, who fought courageously for this country against Nazi Germany while Lord Rothermere wrote admiring pieces about how wonderful Adolf was. Still, Letts does have a point. The civil service is still required in theory to give impartial advice. The Special Advisors, with which the government has surrounded itself are under no obligation to do so. Indeed, quite the opposite. The government’s policy are all drawn from various loony right-wing think tanks, who tell the government exactly the type of Neoliberal rubbish they want to hear. The result is policies like today’s budget: cuts and privatisation for the poor, tax cuts for the rich. And 40 per cent pay rises for the Spads. Well, David Cameron was one of them, and so it really is a case of Osborne giving money to people exactly like himself. It demonstrates the very narrow class loyalties of the Coalition exactly. George Osborne: Robin Hood in reverse – robs the poor to pay the rich. Today’s the day when Osborne will announce the budget, which I don’t expect to be anything else but the same Neoliberal policies of increased tax cuts to benefit the rich, more privatisation, and even more punitive welfare cuts. Following the way previous Tory governments have carried on, these policies will be announced as being ‘good for business’, ‘making Britain more competitive’, while the cuts to the welfare budget will be defended as necessary to pay of the immense debt the country inherited from the last Labour government. There will also be denials that the poor are being pushed further in poverty. Instead, the usual Tory response to this is to claim that they are merely concentrating help where it is most needed. Sometimes there are statements to the effect that the Tories have given more money to the welfare state in real terms than Labour. It’s all rubbish, and I’ve heard them so many times that I can repeat them myself. Scriptonite Daily has put up an excellent demolition of Neoliberal, Monetarist economics that is well worth reading as an antidote to the poisonous, smooth verbiage likely to be utter by Osborne to defend his latest attack on the poor, the sick, elderly and disabled in the name of the wealthy. I found it through Mike over at Vox Political, who got it in turn from the Skwakbox. 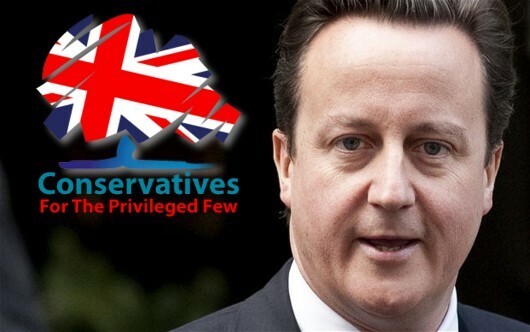 It’s entitled Britain’s 5 Wealthiest Families Richer Than Poorest 12.6 Million? It’s Time for a People’s Budget. It covers and names the very richest individuals, who collectively have more than the poorest section of British society, the way tax cuts for the rich force the tax burden on to the rest of us proles; the use of government subsidies to prop up the banks and financial sector, and the way the public is left paying far over the normal price for PFI hospitals; how government subsidies and privatisation of the utilities have resulted in private industry acquiring the most, and often immensely profitable, parts of these companies, while the tax payer is saddled with the debt, and how the government system of tax credits for the poorly paid actually subsidise poor wages. It finally ends with a list of issues which it would like to see addressed by a ‘People’s Budget’. The piece is over at http://www.scriptonitedaily.com/2014/03/17/britains-5-wealthiest-families-richer-than-poorest-12-6-million-its-time-for-a-peoples-budget/. This morning the lead story in the i was that Cameron had been told by the Tories that he had to stop the gap between North and South widening any further. Further to this story, Osborne had been preparing a ‘Worker’s Budget’ for next week. Quite how far Cameron is from anyone, who could remotely be described as working class is explained in detail in Owen Jones’ Chavs: The Demonization of the Working Class (London: Verso 2012). Cameron’s father, grandfather and great-grandfather were all stockbrokers. His primary school was Heatherdown Preparatory School in Berkshire, whose old schoolboys include Princes Andrew and Edward. When he was eleven he flew across the Atlantic with a group of his school chums to go to the birthday party of Peter Getty, the grandson of the oil billionaire, John Paul Getty. He was, of course, like all good snobs, educated at Eton. Before he went to university, he worked as a researcher for the Tory MP Tim Rathbone, who was his godfather. A few months after this, his father arranged for him to work in Hong Kong for a multinational. Apart from his Oxford and the Bullingdon Club, he managed to get a job at Conservative Central Office following a telephone call from Buck House. When that came to an end a few years later, his girlfriend’s mother, Annabel Astor, suggested to the chairman of Carlton Television, Michael Green, that he should hire him. Which he duly did. So elevated and far from the world of us plebs is Cameron, that he described his wife’s education as ‘highly unconventional’ because she went to a day school. 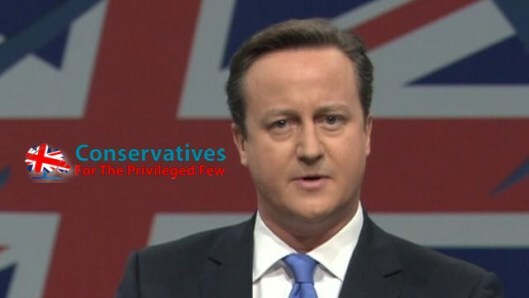 And naturally, Cameron has surrounded himself with ministers from the same elevated social class. 23 out of 29 of his first cabinet ministers were millionaires. 59 per cent of them went to a private school, and only 3 per cent actually went to a comprehensive. So this a government of toffs, led by an extremely rich toff, even by toff standards, who believes he has an automatic right to rule, simply because he is a toff. And his fellow toff, Gideon, sorry, George Osborne, will next week, according to the I, launch a ‘worker’s budget’. The whole idea is a joke. Unfortunately, as the 38,000 people or so, who may have died under Cameron’s welfare reforms, it’s a killer. And that ain’t no laughing matter.